-- Select a Size -- Small Medium - Out of Stock! Large - Out of Stock! Give your dog a special treat that will excite their taste buds and keep them busy. Nylon knobs & compressible center lined with nubs and grooves. Holds Busy Buddy treat ring refills. Grooves can be filled with a variety of smear-able treats. 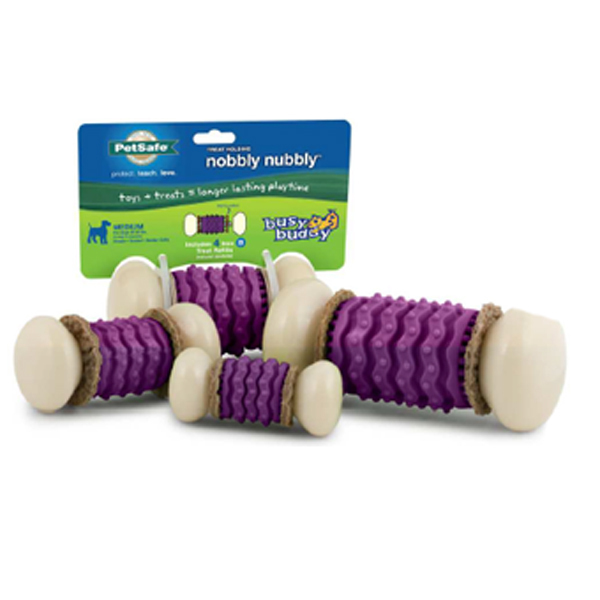 Keep your pooch busy with the Busy Buddy Nobbly Nubbly Dog Toy, that will awake all the senses! Nylon knobs & compressible center lined with nubs and grooves. Grooves can be filled with a variety of smear-able treats. Packaged with 4 natural rawhide treat ring refills. 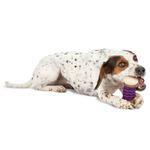 Treat ring refills available in natural rawhide or cornstarch options(sold separately). Posted On 06/28/17 by Gail G from Rosedale, MD Yes, Gail G recommends this product! This is a great toy to keep your dog busy. Made great. Posted On 10/25/15 by Nancy L from Ten Mile, TN Yes, Nancy L recommends this product! This is my little guys favorite toy! He can chew the rawhide rings off in minutes!!! My Shichon always grabs this toy first! He loves it! Posted On 10/18/15 by Nancy L from Ten Mile, TN Yes, Nancy L recommends this product! My little Shitzu mix loves this little toy! Posted On 09/20/15 by Lisa V from , OH Yes, Lisa V recommends this product! This chew toy has become one of our dog's favorite! It truly keeps him occupied. And the treats are made in America, something very important to us. It has lasted several days, which is a big thing here! The dogs love it! Good toy. Posted On 03/22/14 by Kay V from harper, KS Yes, Kay V recommends this product! I've been looking forever for a toy my dog would actually like and not destroy in one day. This is the perfect one! He loves the treats and really loves it when I put peanut butter in the middle groves. I love that I don't have to worry about the peanut butter getting on my floor. It's a win for my pup and me! Great for a heavy chewer! Posted On 11/08/13 by Krista A from Ypsilanti, MI Yes, Krista A recommends this product! My dog is extremely food motivated as well as being a very heavy chewer. It's like this toy was made just for her. The chewy discs are refillable, and are easy to put on. They are the texture of rawhide, meaning that your dog has to chew and chew in order to soften them up to try to eat them. They will keep at it, too, if they are food motivated like mine! Those discs last on there for at least an hour, which is the longest that about anything has ever lasted my dog. I think the flavor from the discs must stay on there, too, because she keeps chewing on the bone even after the treat is gone. They are about the texture of a durachew nylabone, so they can definitely hold up to some super heavy chewing! Absolutelylove, love, love this site!! !